The temple is specially designed to represent Buddhist teaching. The design itself shows the dire dedication and efforts to build the place. It is said that the local artist has contributed a sum of THB40 million (approximately AU$1,516,430) for renovating the building and incorporating new ideas in this place. The idea is to reflect the essence of Buddhist teachings including learning and meditation. The temple is still a work in progress however it is already open for all with free admission. Opening hours: 8:00am-5: 00 pm, closes for 1 hour daily during mid-day. The bridge of "the cycle of rebirth"
To reach the main building, the Ubosot, first you must cross the bridge. The idea to feel here is that to get to the ultimate destination, you must first cross a path. The bridge is made over a small late and is structured with various outreaching hands that symbolize different worldly temptations and desire and to reach beyond the bridge, you must let go of that temptation. Next to the lake are the statue of two very beautiful Kinnaree which are half-bird and half-human creatures and famously known from Buddhist mythology. Cross the bridge and you will see the “gate of heaven” which is welcomed by two sculptures. One of them is Death, the other is Rahu (the one who decides the fate of the dead). You can also witness various mediating Buddas pictures in front of ubsot. The golden building doesn't only represent aesthetic beauty; the color selection symbolizes a deeper meaning. The building is used for restrooms and is mainly structured with golden and white (ubosot). The gold is used to represent the attraction of people with materialistic things, their desire to be wealthier and always have more. Whereas white represents merit, it reminds us to focus and search for peace instead of looking after worldly possessions. There are many means to reach the temple. The place is approximately 20-30 minutes away from the city center. You can either get a tuk-tuk from your hotel or get a shared taxi called songthaew. You can even book a normal taxi from your hotel. The driver will take you the White Temple and will wait for you for 1 hour there. If you are planning to stay there more, you can ride through public bus from Chiang Rai. It has no air condition. The weather is not a problem since it's a temple and you can visit it at any season irrespective of whether it's cold or hot. However, on day to day basis the temple's timing is from 8 am to 5 pm and because of its popularity, the temple usually gets crowded around 11 am. It is recommended to go in early hours if you want to avoid the crowd. You can stay in Chiang Mai for convenience or you can take a day trip to stay in Chiang Rai. The maximum time for the visit will be a maximum 2 hours. The rituals don't take that much and then you can have plenty of time to look around to appreciate the detailed architecture. 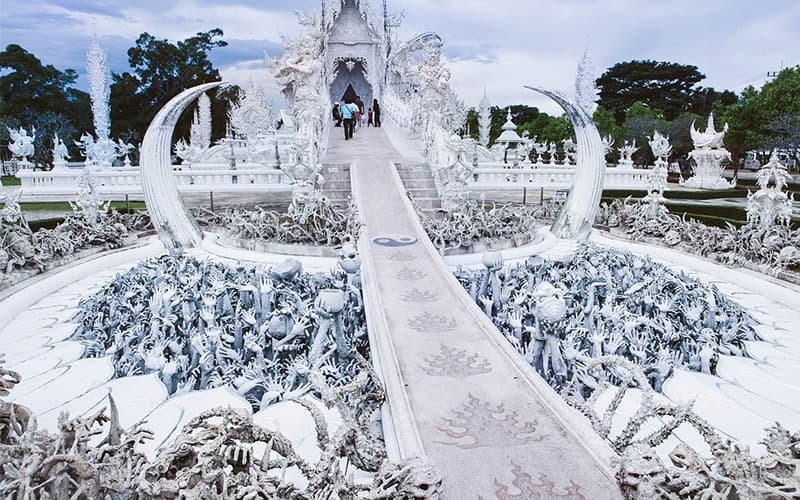 To learn more about Wat Rong Khun, you might be interesting in Thailand culture, history and Buddhist architecture. 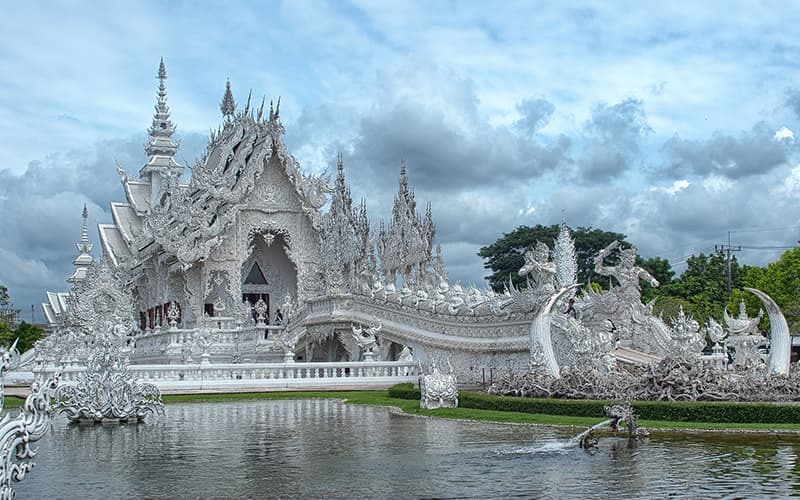 Our popular Thailand tours can include this amazing temple in your tour and also arrange days to Bangkok and Phuket as well. All you need to do is telling us your requirements. Less worry and we will do all for you. See these recommended tour for you.